TAIPEI — Domestic demand to boost the economy in Japan has not yet shown much strength, although Japanese economy is getting out of a slump towed by activation of two big foreign economies rather than a stable, self-generation of domestic demand, according to Tetsuo Kondo, president of Institute for New Era Strategy (INES) in Tokyo, Japan. "Demand increase has been created primarily by external factors of which the first is economic recovery in the U.S. and the second is ASEAN+3, particularly the Chinese economy," said Mr. Kondo, former minister of state for economic planning and minister of labor of Japan. "Can the Japanese economy get back on a self-generating growth track?" His answer is "the issue is not that simple." In an interview with the Seoul Times during the Democratic Pacific Assembly 2004 which was held at Grand Hotel in Taipei Aug.12-15, Mr. Kondo pointed out that Japan had been suffering three excesses caused while riding the upsurge of he economic bubble. "The first was excess plants and equipment, the second was excess debts on the flip side of the coin, and the third was excess employment. These three were reduced in an adjustment process of over 10 years heading to the revival of the Japanese economy," he explained. He maintained that Japan should not rely overly upon expanding exports to revitalize its national economy. The main polar should be self-reliant, self generation of domestic demand. Cutting employees and reducing wages cannot achieve that goal. "Efforts to increase incomes for all categories of people by securing employment and raising wages in accordance with improvements in productivity will pave the way for a steady expansion of domestic demand," he observed. 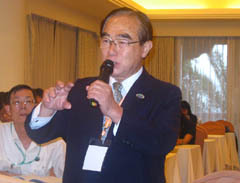 When Mr. Kondo was serving as Minister of State for Economic Planning under the then Prime Minister Yasuhiro Nakasone, he took strong measures to boost domestic demand to stimulate an economy that was shocked by the sudden appreciation of the yen following the Plaza Accord in autumn 1985. Later when he became Minister of Labor in the Kuchi Miyazawa administration, Mr. Kondo strongly supported improvement of working conditions of the people and reasonable wage increase as basic policy for boosting domestic demand so that the national economy move on a self-generating growth path. "Countries of the Asia Pacific region have been acquiring high levels of science and technology industrial and economic power, and financial capabilities as we move from 20th to 21st century, and they must effectively use such great potentials to improve living standards of people in the entire region for prosperous stable social development," he said. As the indispensable step toward achieving this goal and making the most effective use of all available resources among Asia Pacific countries, Mr. Kondo called on ASEAN+3 to strongly support the FTA and the EPA initiatives. "This is basic strategy for sustainable economic growth in the Asia Pacific region," he concluded.